From 6 April 1999, Rapid Industrial Gases Ltd was started, distributing cylinder gases for Air Products with one driver. It was felt that this was a natural progression and complementary to Rapid Welding & Industrial Supplies Ltd.
As an Air Products Agent we offer the full range of industrial gases. The new Maxx and trade shielding gases, standard industry mixtures, acetylene, argon, Coogar, carbon dioxide, helium, hydrogen, nitrogen, oxygen are all available in various cylinder sizes to meet your requirements. 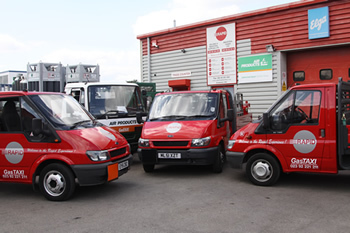 Next working day delivery is offered as standard, or you can collect from our Rapid Gas premises. Air Products is one of the world's largest industrial gas companies and has been serving the welding and cutting industry across the globe for over 60 years. You can rely on us for the best gases, packages, and a daily delivery service to meet your needs. With the UK's largest delivery network of over 400 Agents, Air Products can provide a quality of service which is second to none - see our Agent Locator. From Eastliegh to Chichester, we have a 98% success rate for next day deliveries ( Monday to Friday ). We are committed to providing cylinder gas solutions.